Anti Narcotics Force (ANF) Magistrate Shafqatullah Khan on Thursday issued a non-bailable warrant for the arrest of Pakistan Peoples Party’s candidate for the prime minister’s post, Makhdoom Shahabuddin for his involvement in the ephedrine case. India today said it is disappointed with the "weak" political will in developed countries to provide developing nations enhanced means of implementation of objectives of Green Economy, which will also be a "green-wash" if the process is not democratised. At least 101 people were killed in last three days in sectarian clashes and gun battles between soldiers and insurgents in two Nigerian cities of Damaturu and Kaduna after suicide bombers attacked three churches on Sunday. Britain's Queen Elizabeth has another reason to be cheerful in her Diamond Jubilee year - her annual pay is about to jump by 20 per cent to £ 36 million. Sweden raised the security alert for the country's nuclear power plants today after explosives were found on a truck at the southwestern atomic power station Ringhals and police said they were investigating possible sabotage. The Pentagon has sacked an instructor who presented anti-Islamic study materials in a course for senior military officers suggesting that the US is at war with Islam. The same warrant was also issued for the arrest of the son of former prime minister Yousaf Raza Gilani and Member of National Assembly (MNA), Ali Musa Gilani. The court ordered for the accused to be arrested and presented in court within a week. 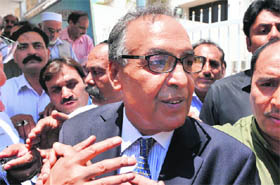 During the hearing at the magistrate’s court, ANF Commander Brigadier Faheem and Investigating Officer (IO) Abid Zulfiqar presented a report stating they had evidence and witness testimonies proving the direct involvement of former health minister Shahabuddin and Member of National Assembly (MNA) Ali Musa Gilani in providing illegal quota of banned chemicals to a laboratory in Multan. Forwarding a request to be an immunity-granted witness, former director general (DG) Health Dr Rasheed Jumma verified in his statement to the investigation team that it was Shahabuddin who approved the 2,500 kg ephedrine quota allotment to Berlex Lab International and 6,500kg to Danas Pharma. He added that Ali Musa Gilani pressed for the allotment of the quota as well. The magistrate approved the request of Brig Faheem and IO Abid and issued a non-bailable arrest warrant against the two accused. Maulana Fazlur Rehman, chief of religio-political Jamiat Ulema Islam, filed his nomination papers along with three candidates from the ruling Pakistan Peoples Party (PPP) and another from the main opposition Pakistan Muslim League-Nawaz (PML-N). Maulana’s entry into the prime ministerial races gave it a new twist as the PPP shied away at the last moment from giving its final stamp of approval to its frontrunner Makhdoom Shahabuddin after the Anti-Narcotic Force (ANF) issued non-bailable arrest warrants on charge of involvement in the multi-billion rupee ephedrine scam. Former PM Yousuf Gilani’s son is also under investigation as the main character in the scandal that has drawn attention of the International Anti-Narcotic Board. Qamar Zaman Kaira and Raja Pervez Ashraf, federal ministers in Gilani cabinet, also filed papers, ostensibly as Makhdoom’s cover candidates. The PML-N fielded Mehtab Abbasi for the coveted slot. Senior PPP leader Khurshid Shah told mediapersons that the final name of the party nominee would be announced after due consultation with coalition partners. But the ambivalent attitude of some allies has added to uncertainty on the outcome of the race. The National Assembly is meeting on Friday afternoon to elect its new leader to replace Gilani. The confusion over PPP’s principal candidate indicated that President Asif Zardari who also heads PPP, is facing problems in securing consensus support from all allies that is needed for the success of its candidate. A total of 172 votes are needed in the 342-member house. If no candidate gets as many votes, a second ballot between two top runners would clinch the matter on simple majority. As around 100 world leaders including Prime Minister Manmohan Singh gathered here for the Rio+20 Summit, India also firmly rejected unilateral measures and trade barriers under the guise of Green Economy, which was the buzz ahead of the deliberations here. It, however, recognised Green Economy as one of the means to sustainable development and poverty eradication. "Green Economy has to be bottoms up and democratised. Otherwise it will be no more than green-wash. Cost of Green Development cannot be unaffordable for the poor," Environment Minister Jayanti Natarajan told reporters. In Kaduna city, Christians retaliated the bombing allegedly carried out by suspected members of Islamic fundamentalist sect, Boko Haram by burning down mosques and killing Muslims. Over 40 persons including six security personnel were today killed in a gun battle between soldiers and insurgents in Damaturu town, the capital of Nigeria's northern state of Yobe. State Police spokesman Patrick Egbuniwe told PTI on phone that 34 of those who were killed were members of the Boko Haram. However, another sources claimed that at the Sani Abatcha Hospital Damaturu, the corpses of eight policemen and three soldiers were brought in. The governments of the two states of Yobe and Kaduna have declared 24 hours curfew to forestall further deadly confrontation. Civilians faced acute scarcity of food and water after being trapped indoors. In Kaduna, where the post-suicide attack left more than 61 people dead with several others injured, many people sneaking to the nearby ATM counters were disappointed as the machines were not dispensing cash. Meanwhile, the country's top security chiefs, including the chief of Defence Staff Air Marshal Oluseyi Peturin have headed to the conflict zones to have a first-hand assessment, assuring the civilians that normalcy will return to the state immediately. In another city of Maiduguri where the militants have their base, the Joint Task Force (JTF), a military unit meant to restore order in the area, alerted the residents of the plan of the dreaded Islamic terrorist group, Boko Haram to engage in series of suicide bombing. Boko Haram, a radical sect, has been waging war to install an Islamic government and Sharia rule in Africa's largest oil producer. The group's insurgency has been growing in Nigeria and an attack in the northern city of Kano with multiple bombings and gun shots killed no fewer than 185 persons on January 20. A suicide bomb attack by the group at the United Nations headquarters in Abuja in July last year killed 26 persons. Australian police said a military aircraft saw some 40 people standing on the upturned hull of the boat. "We know from what we have been hearing from the aircraft there are not 200 life jackets on board," Western Australian police commissioner Karl O'Callaghan told local television. He said at least 75 people were feared to have drowned. An Australian customs spokesman said border protection had detected what was believed to be a people-smuggling boat in distress earlier on Thursday. "Indonesian navy ships are on their way there now," Indonesia's National Search and Rescue Agency (Basarnas) spokesman Gagah Prakoso told Reuters. The sinking occurred within Indonesia's search and rescue zone and Australian authorities were offering assistance, Australia's Maritime Safety Authority said. Refugees seeking asylum in Australia often set sail from Indonesia heading for Christmas Island in dangerous and overcrowded boats. As many as 200 died when an overcrowded boat sank off the coast of East Java in December, 2011. Her property holdings, known as the Crown Estate, posted a record profit of £ 240.2 million ($377.4 million), a net rise of 4 per cent in the year through March 2012 largely due to strong tenant demand for its shops in the upmarket Regent Street and St James's districts of London. At a time when Britain is in recession and many families are feeling the pinch of higher household costs and taxes, the Queen's allowance will rise to 36 million pounds from £ 30 million, the level at which it was frozen in October 2010 under new laws which peg her pay to the estate's profits. "It's a great set of results and I'm sure everyone's going to be happy," Crown Estate Chief Executive Alison Nimmo said. The 85-year-old Queen celebrated her 60th year on the throne this month with a 1,000-vessel flotilla on London's River Thames and nationwide street parties. She has been paid by taxpayers through an allowance set by Parliament and via other government grants since King George III ceded all property profits to the Treasury in 1760. The Crown Estate pays all of its profit to the Treasury, or finance ministry. Under new laws that come into effect in 2013-14, the monarch's pay is calculated as 15 per cent of the estate's profits from two years prior. The changes were designed to ensure the Queen's pay would rise and fall with the health of the British economy, which this year entered its second recession since the start of the global financial crisis. Used mainly to pay the Royal household's staff as well as for items like laundry, stationery and official functions, her 2013-14 pay will be the highest since 2008 though still less than half of her 1991 pay of £ 77.3 million. The Crown Estate, which owns a mix of wind farms, retail parks and most of Britain's seabed in addition to its central London properties, outperformed the industry's I n vestment Property Databank (IPD) be n chmark index due to strong international interest in the London property market and the country's growing dependency on renewable energy. The value of its property portfolio rose 7.4 per cent to £ 7.6 billion from the previous year, while the total return, which includes rental income, was 16.8 percent, outperforming the IPD index by 10.4 percentage points. Police said bomb sniffer dogs detected the explosives during a routine check Wednesday afternoon by security staff at an industrial area within the power plant's enclosure. Police declined to describe the amount or type of explosive material. Four reactors are at Ringhals, 70 kilometers (45 miles) south of Sweden's second-largest city, Goteborg. 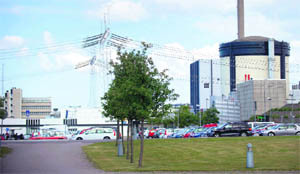 The plant is controlled by energy companies Vattenfall and E ON. Bomb technicians said the material lacked an ignition device, meaning there was no danger of an explosion. Police spokesman Tommy Nyman said officers were investigating possible sabotage but had no suspects.